Dempsey Says If Needed He Would Recommend Ground Forces In Iraq : The Two-Way The chairman of the Joint Chiefs of Staff told a Senate panel he supports the president's plan to combat Islamic State militants but that if it proved necessary, he would recommend U.S. ground forces. 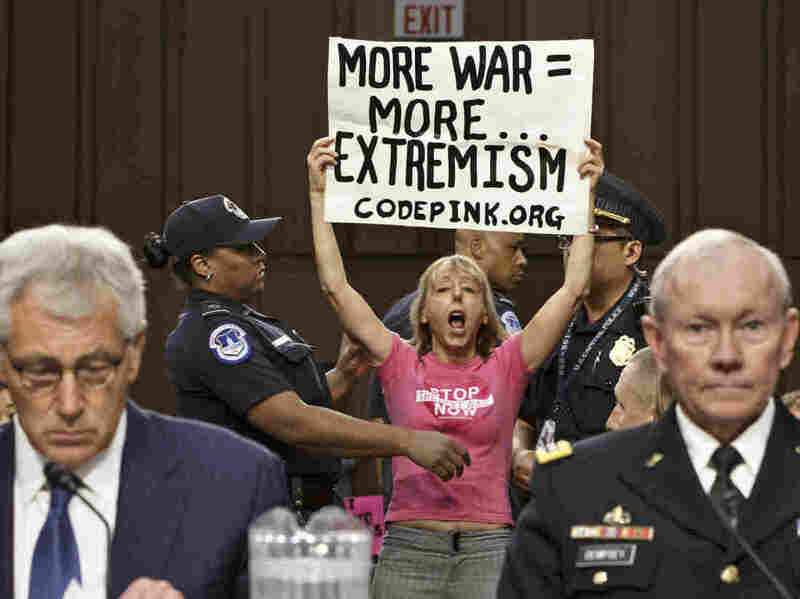 Members of the anti-war activist group CodePink interrupt a Senate Armed Services Committee hearing with Defense Secretary Chuck Hagel (left) and Gen. Martin Dempsey, chairman of the Joint Chiefs of Staff. Gen. Martin Dempsey, the chairman of the Joint Chiefs of Staff, told lawmakers today that while the president has ruled out "boots on the ground" as part of a campaign to destroy the Islamic State insurgency in Iraq, he was prepared to recommend a combat role for U.S. advisers or ground troops if the situation warrants. "To be clear, if we reach the point where I believe our advisers should accompany Iraqi troops on attacks against specific ISIL targets, I will recommend that to the president," Dempsey told the Senate Armed Services Committee, using an alternative name for the self-proclaimed Islamic State, the extremist group that controls parts of Syria and Iraq. In testimony before the Senate Armed Services Committee, Dempsey and Defense Secretary Chuck Hagel outlined the White House plan to "degrade and ultimately destroy" the Islamic State. Pressed on the question of a direct combat role for U.S. forces on the ground, Dempsey said that if he felt it was necessary, he "would go back to the president and make a recommendation that may include the use of ground forces." But he noted he had not seen a situation as yet that would meet that threshold. Asked whether he agreed with the broad strategy the White House has outlined, Dempsey said he did. "This will not look like 'shock and awe' because that is not how ISIL is organized. But it will be persistent and sustainable," Dempsey said, referring to the airstrikes that preceded the ground invasion of Iraq in 2003. Dempsey also said the U.S. was prepared to conduct airstrikes inside Syria if necessary. In answer to a question from committee Chairman Carl Levin, D-Mich., as to whether the 5,000 or so moderate Syrian rebels that the administration hopes to train to fight the Islamic State would be enough, Hagel said: "Five thousand is a beginning, Mr. Chairman. This is part of the reason that this effort is a long-term issue." Hagel sought to allay concerns about U.S. weapons falling into the hands of extremists such as the Islamic State. He said the U.S. would "monitor closely" to ensure they don't. "There will always be risk in a program like this, but we believe that risk is justified by the imperative of destroying ISIL — and the necessity of having capable partners on the ground in Syria," the defense secretary said. In one tense exchange, Sen. John McCain, R-Ariz., asked whether the U.S. would be prepared to use air power in support of the moderate Free Syrian Army rebels if they were attacked by the forces of Syrian President Bashar Assad. "Our focus is on ISIL, and that is the threat to our country," Hagel responded. When pressed, Hagel said the rebels would "defend themselves" and that the U.S. would "help them." McCain appeared unsatisfied with the answer, but when he turned to Dempsey, he got a similar reply. The Arizona senator and former GOP presidential nominee concluded that the administration's failure to anticipate such a possibility was "a fundamental fallacy in everything you are presenting to this committee today."